There’s nothing I like better than a good album but sometimes I need to get my Metal fix by reading a book about my favorite bands. Actually, all the books I read nowadays are biographies on bands! 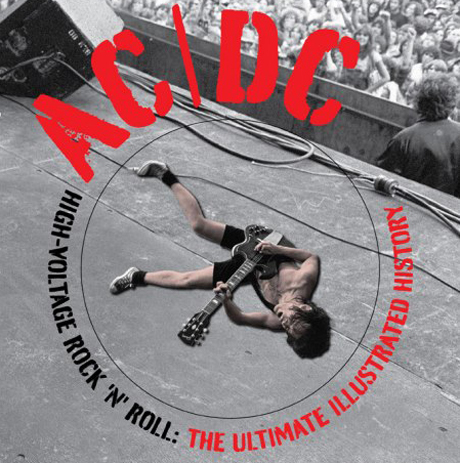 When AC/DC – High Voltage Rock ‘N’ Roll: The Ultimate Illustrated History crossed my desk in late 2010, I thumbed through it really quick and realized that this could possibly be one of the better books released over the year. The first thing that catches your eyes is the front cover of Angus Young performing one of his famous stage moves while flat on his back on stage…..the fun thing is you can actually spin the circle and make Angus do his thing! Right there, you know you have something different. 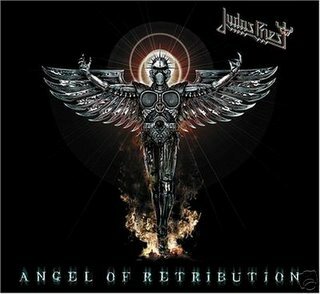 When I read a biography or history on a band, I always look for the attention to detail, the research and opinion. It’s fine to have a bunch of pictures in a book but the attention to detail in the captions and credits can make the read even better. Same goes for the actual writing, if there’s no attention to detail and no research then all you have is common knowledge and hearsay bound as a book. Author Phil Sutcliffe really put together one of the best books about AC/DC that I’ve seen in a long time by adding plenty of pictures of the band and memorabilia to his penned AC/DC history that takes us from the band’s humble beginnings straight through the band’s 2008 album, BLACK ICE. I grew up with ’80s AC/DC so it was especially important for me to be able to read about the earlier lineup of the band with the late Bon Scott on the mic. Almost 30 years on as an AC/DC fan, I love the Bon Scott led albums, and I know part of the band’s history, but AC/DC – High Voltage Rock ‘N’ Roll: The Ultimate Illustrated History gets in depth not only about Bon’s time in the band but also each member’s beginnings and AC/DC’s first incarnations including the Dave Evans era and their trip through Australia’s pub circuit. As the book travels through AC/DC’s past, each album gets there own special review by other Rock journalists to not only lend a fresh perspective on the music made but also how the album related to AC/DC’s overall history. AC/DC’s first few albums had multiple issues depending on the territory it was released (Australia, North America, Europe, Japan) and sometimes an album was didn’t get a release in some countries until years later, this book sorts through these details and provides pictures of the different album artwork for the discerning collector. And that’s another thing that appeals to me, this book feeds a collector’s needs as well. It wouldn’t be an illustrated history without plenty of pictures and there are tons of pictures of merchandise and memorabilia from album covers to backstage passes, from picture discs to 45s, programs, posters, buttons, handbills and also the instruments. Add in all the rare photos of the band playing live across the world and you can just thumb through the book and see the band’s history! 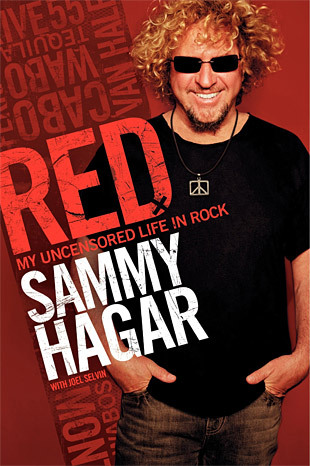 Some other cool additions packed in the book’s 224 pages is the attention given to the Young brothers’ gear that they use both in the studio and on stage, details on the working relationship the band had not only with each other but with their various producers, and an Afterword to end it all by Joe Elliot of Def Leppard. If you’re an AC/DC fan (and how many Rock fans out there aren’t), then this is a great book to read up on the band’s complete history but also to get a sense of that history visually with all the band pictures and memorabilia. If you’re a collector, then this book will appeal to you as well with tons of pictures from private collections of the band’s albums, singles, t-shirts, posters, backstage passes, etc…..there’s plenty here to look at for everyone. My favorite part of the book was the album reviews, they were in depth and really not only gave you the information needed but there were definite opinions on each release whether good or bad, something that is rare in a retrospective type book like this. Getting the handle on which version of each album was released when in different countries was especially important to me to fill those holes in my AC/DC collection. If you want to read, or look, at a great Rock book, then AC/DC – High Voltage Rock ‘N’ Roll: The Ultimate Illustrated History is a good one to pickup.